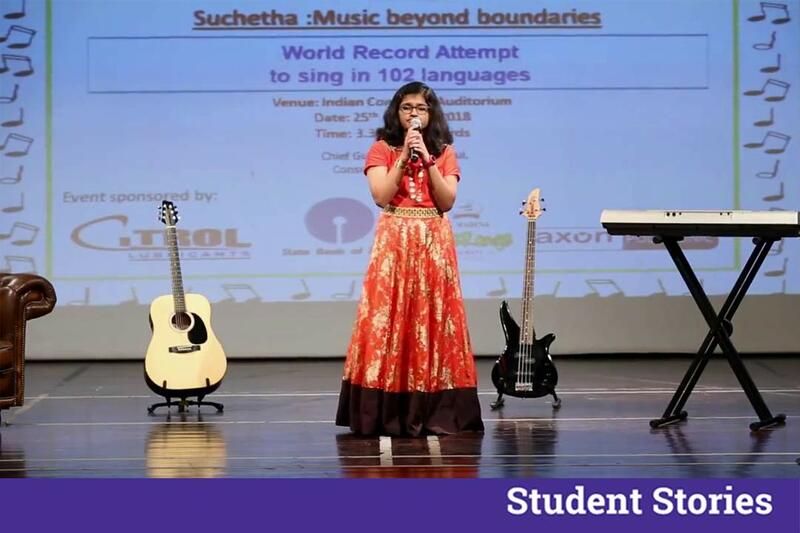 Meet, Suchetha,12, sings in 80 plus languages makes a world record! Suchetha studies in the seventh standard of Indian High School and can sing in 80 languages. In a video which has gone viral on social media, she can be seen singing continuously in different languages. She made the Guinness World Record by singing in 85 languages. Suchetha can sing in 80 languages, and she has learned to do so in just one year. She broke the record of Ghazal Srinivas who holds the record for singing in 76 languages at the Gandhi Hills, Andhra Pradesh, India on June 2-3, 2008. 1. How has your experience been so far in singing? Though I have been singing in the English language at my school competition for years now, I began singing in various foreign languages since last year. My first foreign song was in Japanese, and I found French, Hungarian and German the most difficult languages to sing in. 2. You are born in a family of singers. Has it helped you in any manner? Born in a family of ardent music lovers, I started learning Carnatic music at the tender age of four. At eight, I started learning Hindustani music and is all set to face the third level exam in it. Family support helps an aspiring child like me in numerous manners beginning from getting the confidence to regular practice sessions. 3. Tell us about your initial experimentation with different languages? My first song in a foreign language was in Japanese. My father’s friend, a Japanese dermatologist, came to Dubai a year ago. When she came home, she sang a Japanese song. I liked it very much and learnt it. 4. What part did your parents play in this empathetic journey of yours? My parents help me choose languages from the recognized list of world languages. My mother checks the age-appropriateness of the songs. She has to depend on people who know the language or Google translation for that. 5. How do you choose songs which you will perform? The first criterion for shortlisting a song is the availability of karaoke. The ease of learning the song depends on the length and complexity of the lyrics. Usually, I take around two hours to learn a song. If it is easy to pronounce, I can learn it fast. If it is not a lengthy song, I can finish in half an hour. French, Hungarian, and German were the most difficult ones for me. I took a couple of days to learn those songs. 6. Have you inculcated traditional songs in your singing list? I have tried to include traditional songs in many languages from different continents. There are some songs in dialects or branches of some languages like Yue Cantonese, a branch of Mandarin, for example. There are some songs without any lyrics like the Hungarian song I learned. 7. Apart from music what else inspires you to go further in life? A recipient of Shaikh Hamdan Award for Academic Excellence, I am also an excellent dancer and a spell bee champion. Though my role models are Indian singers Lata Mangeshkar and Shreya Ghoshal. I wish to pursue a career in medicine like my father.